Find more great things to do and places to visit in this region. Start driving at Kittery on the New Hampshire-Maine border and continue northward through the towns of York, Ogunquit, Wells, Kennebunk, and Saco, ending at Old Orchard Beach. This 40-mile drive takes you through a string of charming little towns clinging to sandy beaches and rocky coastlines. Southern Maine is a glorious vacationland for families in particular because of its amusement parks and wide, sandy beaches, including one – Old Orchard Beach – that offers a cheerfully honky-tonk flavor, complete with fireworks, car shows, and sand sculpting competitions. That said, there is plenty of enjoyment for adults without kids, like outlet shopping, walks and bird watching at the Rachael Carson nature preserve and Marginal Way, cruises, and lobster dinners, from formal to rustic – on picnic tables covered with brown paper. The major highway serving this area is I-95. Once you get to the area, shift to Route 1A or Route 9 to get yourself cheek-to-cheek with the ocean [see map]. These roads, apart from I-95, travel through towns, so prepare for slow traffic in the high seasons of summer. Ogunquit (to choose a mid-point town) is 75 miles north of Boston, MA; 35 miles south of Portland, Maine; and 61 miles northeast of Manchester, NH. All these cities and towns have airports. 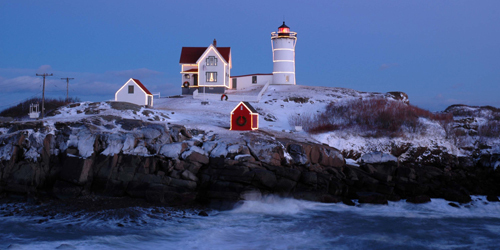 Yankee Magazine named Ogunquit Museum of American Art the state's Best Museum Inside & Out. Why? A large glass wall facing the sea invites the beauty of outdoors inside, and invites museum visitors to finish their tour of the galleries with a walk among the extensive collection of outdoor sculpture. 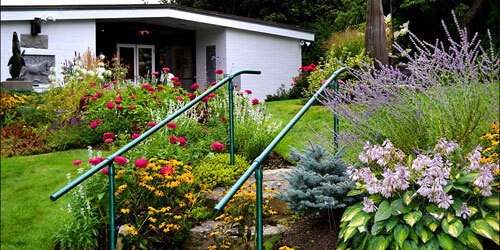 An easy stroll on the museum's property takes you through sunny flower borders and cool, shade gardens, a reflection pool and secluded benches. The garden even has its own map. Museum is open May through October. 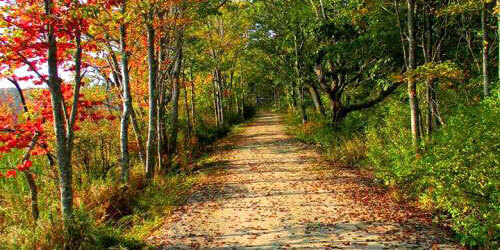 This one-mile paved footpath along the shore near Ogunquit is famous for its gorgeous coastal views from an elevated bluff. To start your walk on the Marginal Way, you may park at Jackie's Too Restaurant on Perkins Cove Road near the south end of the walk or on Cottage Street near the north end of the walk. Consult this simple map and take a camera. The beaches of Ogunquit are strung along a three-mile peninsula of sandy beach and grassy dunes, forming a natural barrier between the Atlantic Ocean and the Ogunquit River. The mid section of Ogunquit Beach -- the Footbridge Beach -- is across a footbridge from the Ogunquit River. The far end of Ogunquit Beach is called North Beach. Swimming and bodysurfing, sunbathing, or walking the wide sands in search of shells and driftwood. This lighthouse, famous as the centerpiece of a yearly town Christmas celebration and extensive decorations, is in York along Route 1. A channel separates the lighthouse and the island on which it sits from Sohier Park. The public may not enter the island and the lighthouse, but the park is a delight. People may enjoy the view, eat a picnic lunch or dinner, take pictures, go fishing, go scuba diving (except on Sundays), bring a dog (on lease), and browse the gift shop (open daily mid-May to late October). Shop! The town of Kittery is home to the exhaustive (exhausting?) Kittery Outlets and Kittery Trading Post. The Trading Post, in particular, is your source for sporting and outdoor gear. Take your picture next to the moose; it is the closest you will or should ever get to one of these Maine lapdogs. 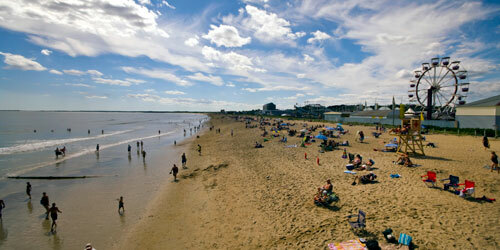 With its long pier and its Palace Playland amusement park, Old Orchard Beach is a charmingly honky tonk place of razzle-dazzle, marquee lights, weekly fireworks, classic junk food, car shows, and watching the girls go by. Lots of pizzazz and special events. Youth-oriented and great fun! Rachel Carson, author of the 1962 best-seller Silent Spring, is considered the godmother of the environmental protection movement in America. The refuge named for her is a patchwork of several different properties stretching along 50 miles of coastline from Kittery to Cape Elizabeth. People can explore these salt marshes, creeks, estuaries and homes of migratory birds. The refuge headquarters is in Wells. Brochure with maps. 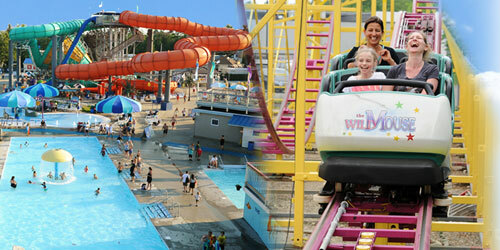 Kids will flip (year after year) over any chance to play in the water slides of Funtown Splashtown in Saco and to stare at the majestic beasts at York's Wild Kingdom in York. Prepare for a full day of fun when your children launch from the car into these fun-filled adventures. Adults are most welcome to play and explore, too! Brace for requests for ice cream. Was founded in 1933 in a renovated garage in Ogunquit's town square and it's known as "America's Foremost Summer Theatre." Classic musicals, children's shows, backstage tours. Summer theater! What's better'n that? The Omelet Factory at 422 Main Street in Ogunquit will take good care of you. Many choices of omelets (including lobster-stuffed), fluffy French toast, sweet breads and muffins. Salt and Honey at 24 Ocean Avenue in Kennebunkport will set you up for a big day. Customers praise the blueberry pancakes (it's Maine, right? ), hash made from short ribs, huevos ranchero and breakfast burritos. Restaurant overlooks the Kennebunk River; digest with a stroll along the river; you could continue walking along Ocean Avenue to the Atlantic. Amore Breakfast at 309 Shore Road in Ogunquit has coastal Maine wrapped up and ready for you: lobster omelet, blueberry jam or pancakes -- plenty of fuel for a day on the beach or at the outlets. 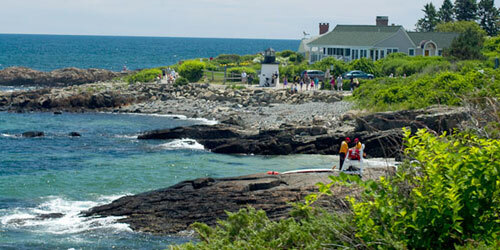 Jackie's Too, on Perkins Cover Road in Ogunquit is on a pretty cove at the southern end of the Marginal Way. Fill up for lunch before taking the walk or finish your walk with drinks and dinner (Leave your car at the J2 parking lot). Hefty menu brims with seafood and other American favorites. The Goldenrod on Railroad Avenue in the heart of York is a down-home spot frequented generation after generation by local people and happy vacationers. In addition to all the classics (think: a stuffed lobster roll or blueberry pancakes), the place has a giant penny-candy counter that goes on forever. You can stand on the sidewalk and watch salt water taffy being made. Bob's Clam Hut at 315 US Route 1 in Kittery is clam country: whole belly clams, clam strips, clam chowder, and a spicy lobster stew just for some diversion. If you are shopping in Kittery, here is a place to get off your feet, fuel up, go back into the stores. If you're with kids, work off the meal at the nearby For McClary State Park, on the Piscataqua River. Follow Route 103. Ogunquit Lobster Pound at 504 Maine Street in Ogunquit is a casual, old-fashioned family-style restaurant where guests can choose their lobster for dinner from a salt-water tank. The lobster is divine. Joseph's By the Sea at 55 West Grand Avenue in Old Orchard Beach is right on the water (beach walk before or after dinner!). People rave about the lobster potato pancake appetizers and the friendly bar. The Old Village Inn at 250 Main Street in Ogunquit is, indeed, an inn (since the 19th century), with a pub and restaurant. The atmosphere is gracious and tasteful and welcoming -- and more for adults and older kids than nearby seafood shacks.